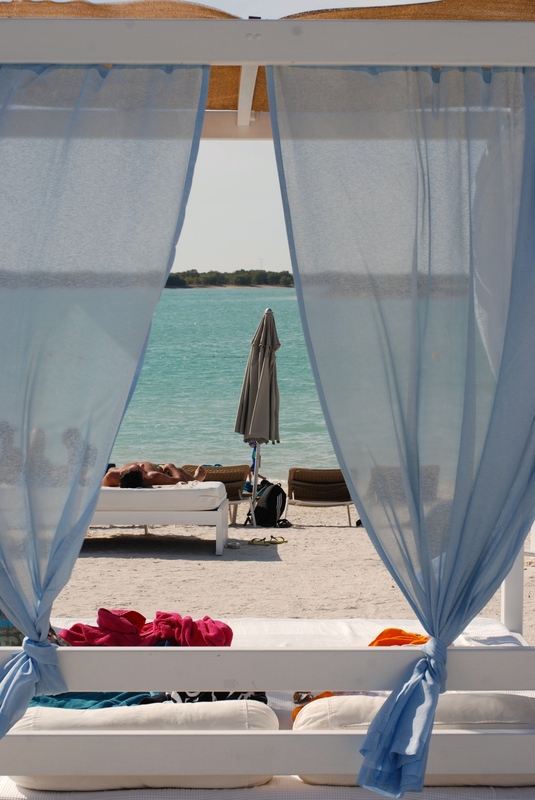 I have to admit I have a Cabana Crush.... we visited Yas Beach a few days ago and I am now lusting after one perhaps for my backyard I think it was the pastel curtains blowing with the wind that swept me off my feet. I feel we are having the perfect beach weather of late so it's the perfect opportunity to visit if you haven't already. Yas Beach is a great place to spend the day or afternoon and it truly caters for each individual with a variety of water activities including paddle boarding, kayaking, or sailing (which I'll get back to you on) as well as a court for beach volleyball. For those who want to relax and work on their tans there is the option of free daybeds or rentable cabanas, I love the subtle lounge music in the background forget the cabanas I'll just take the whole beach experience back to my backyard lol. I didn't get the chance to order some food but for sure a cocktail which can be hand delivered to your spot on the beach now thats what I call service and something even the infamous corniche can't compete with. A lot of people aren't even aware there is a beach on Yas so I really encourage you to get on down. Usually you find segregation on the beach between families and the young hip party crowd but here they mix well together here not minding each others company. We paid a small entrance fee of 25DHS pp (thanks Etihad for the 50% discount) which included towels OMG I think I jumped for joy not a the price but at not having to wash my towels on arrival back the house sad I know but it's the little things.